On Being Home – #lovenotesfornicholas – the story of HELLP & how 1 micro-preemie changed our lives forever. We’ve been home for a little over a month now – which is hard for me to fathom. I told one of my cousins the other day that I sometimes look around my house and see Nicholas and think (for a split second) ‘That’s not my baby – must be someone else’s – mine is still in the NICU.’. Then, as if on cue, Nicholas begins to cry or grunt (one of his most favorite sounds these days) and I snap out of my state and know he is mine. I know we are home. And that feels good. We arrived home right before Christmas. I know I could’ve just sat down as soon as we walked through the door and not done ‘Christmas’ in the usual sense of the word for us. Our Christmas shopping had been finished for several months now and, let’s face it, I could’ve thrown things in bags stuffed some tissue paper in and called it a day. But, I didn’t. Call me crazy but it was Nicholas’ 1st Christmas and he wasn’t having to spend it in the hospital and for that we needed to decorate and celebrate and trim the trees (and the staircases, and the windows, and the front door!). So we did. I know Nicholas may not remember his 1st Christmas but I like to think his heart & soul will remember the feeling of Christmas from the very 1st one and that’s all that matters. Andy humored me the whole time. He followed me around for 2 days saying “what else can I do?” and “where does this go again?” just so we could be done decorating and enjoy time together (and so he wouldn’t get fussed at when he went to ‘play’ in the garage). And I’m glad we did. Nicholas we quickly found could be soothed by looking at Christmas lights. It was our saving grace during some bad heartburn days, those lights were. He would start to cry and then his cries turned to screams and the screams to total meltdowns and you’d walk over to one of the trees (or the staircases or the windows or the doors – I’m telling you this house was Martha Stewart on steroids at Christmas time decorated) and he would just stop crying. Like that. No bouncing or singing or toys required. Just lights. I ended up keeping the decorations up way past epiphany for Nicholas’ sanity (and for ours, too). This Christmas we carried on some family traditions and even started one our own favorite ones: we practiced the fine art of not ever changing out of our Christmas pajamas all day long. 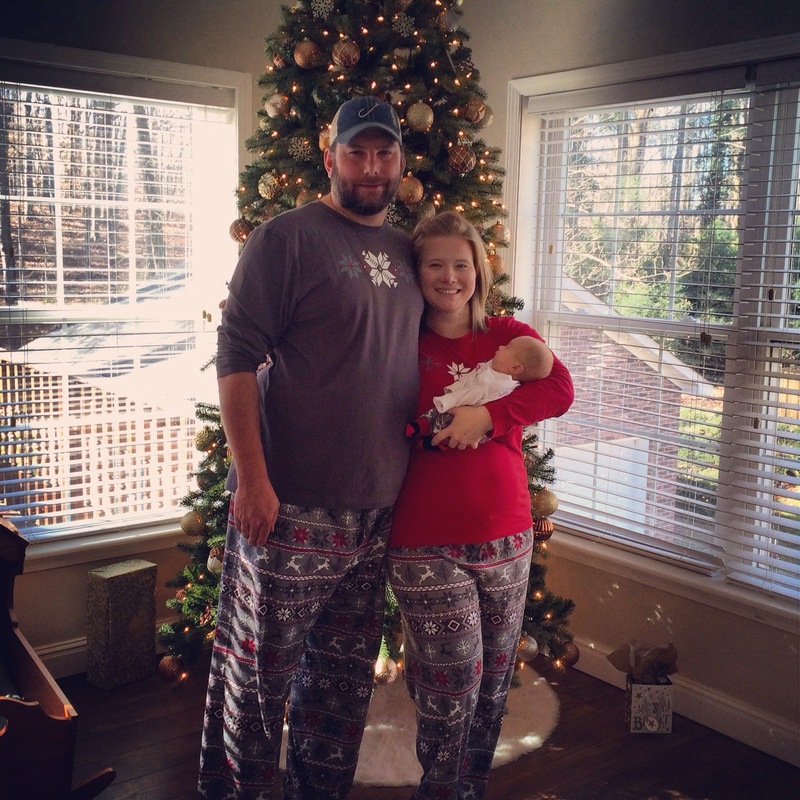 And, yes, we all had Christmas pajamas – and yes, they all matched (shoot for me wanting a hallmark moment). We spent Christmas at home together as a family. Santa came and he was good to everyone. We spent the morning with Uncle ‘Bubba’ Parker and soon-to-be Aunt Jen drinking mimosas (again, there’s rarely a reason I don’t find champagne an appropriate accessory) and making country ham biscuits and our family’s Christmas morning coffee cake. We had an impromptu visit from Great Uncle Boyce & Aunt Deloras in the afternoon and spent the rest of the day watching A Christmas Story, reading books, and napping. The rest of the days following Christmas and up until now have been a bit of a blur for us. Our New Years was, by most folks standards, uneventful. We were asleep by 11:30 pm (but were up again at 2 am and 4 am and 6 am). We wouldn’t change it for the world. We had a few doctors appointments, nothing terribly noteworthy, which is a blessing. Nicholas did have another round of the RSV vaccine right after Christmas. The vaccine, also known as Synagis, protects high-risk babies from respiratory virus. We started this vaccine one of our a last days in the NICU. Since Nicholas spent much of his 1st days receiving respiratory support in some form or fashion, he was an ideal candidate for the vaccine. I’m glad we chose to add this vaccine to his medical care plan- I have come in contact with several moms who chose not to vaccinate their baby and ended back up in the NICU for another long stay to care for a lung infection. (This is not a political statement about the importance of vaccinations – simply a case in point that vaccines, for us, are an important part of Nicholas’ care plan). We also received a home visit one morning by a team of occupational therapists. Our pediatrician recommended we have a visit to see how he has continued to progress since we left the NICU and since we had so much interaction with OTs while in the NICU we happily agreed. They came and played with Nicholas for about an hour and talked with us about his medical history and how he is adjusting to being at home. At the end of their time with Nicholas they simply said “He is doing remarkably well- if we didn’t know he was a preemie, wouldn’t be able to tell”. Andy and I were sitting on opposite ends of the couch at that time but we did fist bump each other from our seats. We both felt like we had helped, and loved, and prayed for Nicholas to beat prematurity (I know being a preemie isn’t a disease that you can beat like cancer). But after we spent so many weeks hearing all about how this and that and the other would be hard for Nicholas because he was premature, to know hear their words was victory for us. Yes, there are still milestones ahead of us – we’ll deal with those as they come. I can’t believe we’ve been home for over a month. I still have days where I wake and think we have to go to the NICU to visit our son (no, this is not a bonding issue – I think it is an extremely normal response when you’ve been through a traumatic and uncertain time and are adjusting back to ‘normal’ reality). I don’t go but a few days until I wonder how our nurses are. I think about the families we met while in the NICU, several of which I know are still there, and my heart hurts for them. I still find myself checking to make sure he’s breathing. I watch him sleep and wonder what he may be dreaming about. I hold his hands. I hold him. And just watch him take in the great big world for the 1st time. I have spent more time just watching him ‘be’ than I ever imagined I would. And it is more heartwarming, and at times, more comedic than Hollywood blockbusters could ever pretend to be. So glad everything is going well. Love the posts. Reading this precious post gives me chills to think about the miracle that is Nicholas, and tears to see and be able to share the joy of his new life and your wonderful family. We loved celebrating with you on Sat, and we look forward to sharing his life with all of you! With much love all the days of his and your lives! Enjoy reading your posts regarding Nicholas. We continue to hold you in our thoughts and prayers. Love,Aunt Jan and Uncle Karl.